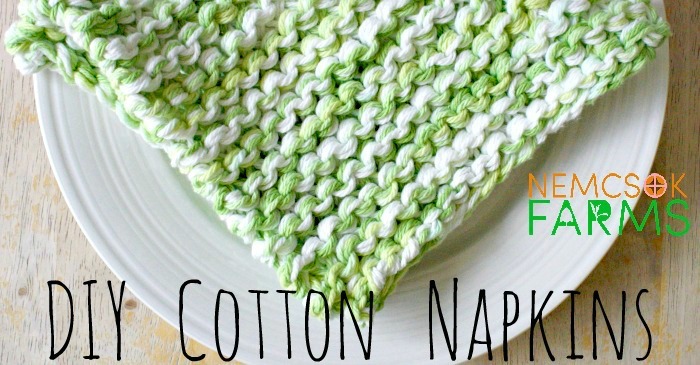 Cotton Napkins, that you can totally make yourself! Seriously, this project is just loaded with instant gratification. Easy to make, quick to finish, good for our planet, and 100% tailor-able to your colour preference… why not just give yourself that pat on the back right now. Reusable soft cloth napkins are washable, re-usable and ideal for cleaning sticky little faces and fingers. They are way better than any paper product, but they are also expensive. Have no fear, you can totally make your own with scrap fabric, and I highly recommend it, and there are a couple of ways you can make them without having to worry about tidy mitered corners and so on, and that is a DIY for another day. 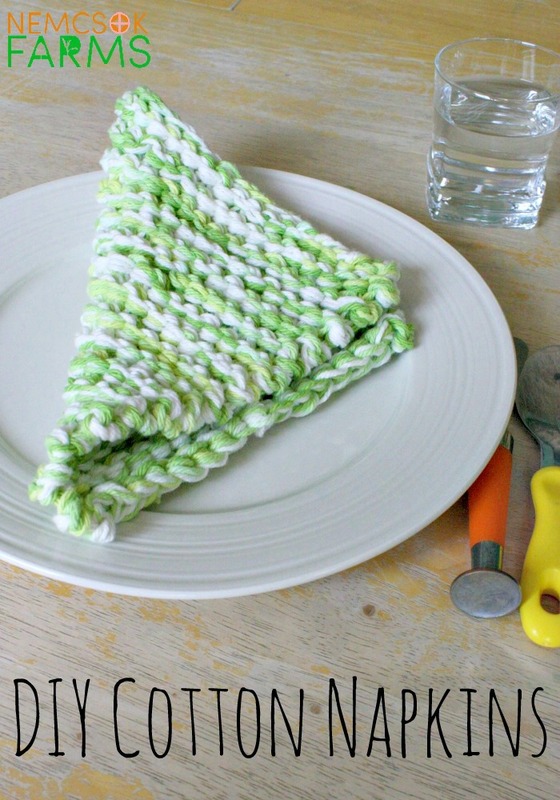 Today though, I’m going to show you how to knit your own cloth napkins. For real. So, yeah, you’re going to need to know how to knit. But don’t sweat it, I’ve got you covered. Head over to our How to Knit Series, and grab the tutorial for Casting On, Making a Knit Stitch, and Binding Off as those are the only knitting skills you’ll need for this pattern. 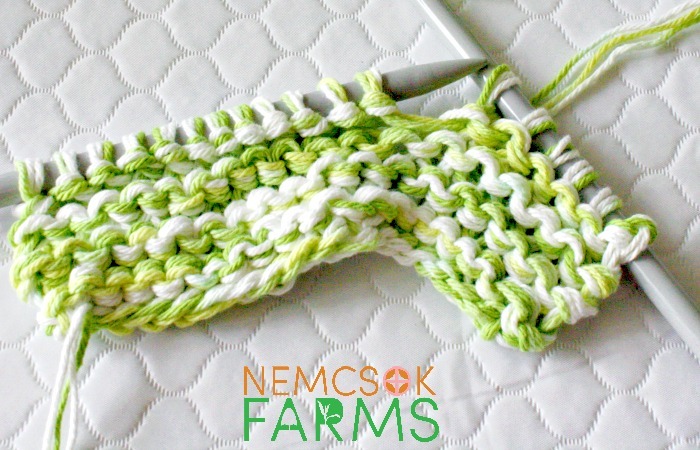 This napkin is used with three strands of yarn held together. This means your project will work up quick, and will be nice and thick – a good quality, sturdy handmade napkin is what you’re after. You do not need to purchase three balls of yarn. 340gm ball of Key Lime Pie by Bernat will be enough yarn to complete several napkins. Just pull out three different strands ( approx 100′ each should do) and use them held together as seen in the photo below. 100′ of yarn isn’t actually all that much, and this napkin took me about 20 minutes of knitting time. I had to take a one hour road trip between rows, but that’s another story for another day. An easy way to pull out 100 feet of yarn is to find the end of the ball from the centre, and pull out your arm span worth of yarn until you get to approximately the right length. I am just over 5′ tall so I pulled out my arm span worth 20 times to get 100 feet, cut the yarn and repeated that two more times, giving me three strands, all to the right length. You can wind these strands together to make a ball, or you can just get knitting! It won’t take you long. Prepare your strands of yarn as described above. Or just use three balls. Totally up to you. Bind off the stitches, cut yarn, secure the last stitch, and weave in ends. So we already know why we should use these DIY Cotton Napkins instead of the paper ones – and we know how to make them too. That’s awesome. Did you also know that you can totally use these for wash clothes, dish clothes, and they make great rags when they start to wear out? These possibilities are endless. Join our Knitting Club and be sure to try all the other easy knitting patterns we have here like this I-Cord, this Infinity Scarf and this super awesome Rag Rug and of course, don’t forget to build your Knit Kit .